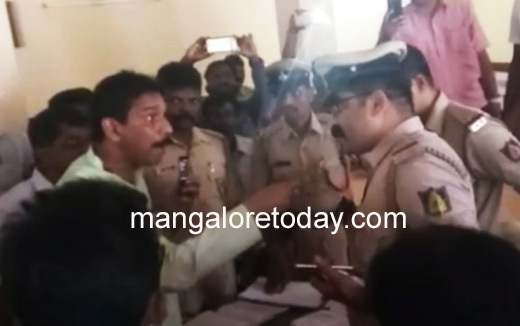 Mangaluru, Sep 07, 2017 : A video has surfaced of the city Lok Sabha M. P. Nalin Kumar Kateel behaving in a shockingly crude manner with a police officer. In the video Nalin Kumar is seen using foul language and making violent physical gestures like pointing finger, banging table etc before the officer. The M.P. is seen to be visibly shaking with rage and at one point he even tries to grab the mobile phone of the police officer. He goes on to threaten a city bandh if his demands were not met by the police officer. 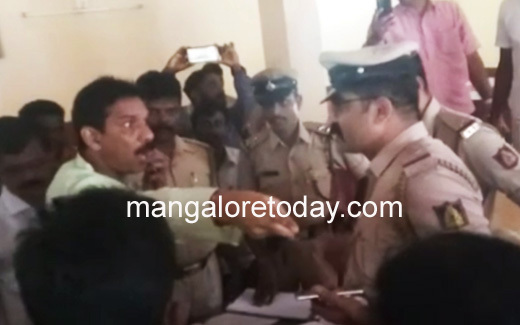 The officer concerned is identified as Inspector Maruti Nayak attached to Mangalore East Police Station situated at Kadri Hills. In the video he looks confused and fidgeting with his cell phone. Once he tries to pacify the M.P, addressing him as ‘Sir’. But the M.P. was obviously in no mood to cool down and continued to spew venom on the officer till the end of the 49-second video clip. The video is being circulated on WhatsApp by the Sanghi Parivar supporters with a brief note - ‘Breaking News – See How MP Nalin takes the police to task for arresting party workers’. It is learned that what irked the M. P. was the fact that a lot of BJP workers who had arrived to participate Mangaluru Chalo Bike rally organized by BJP Yuva Morcha this morning had been arrested by the police as the authorities had denied permission for the gathering. It is said that the M.P. had secured bail for their release, but the police officer was refusing the release the party workers as he was awaiting clearance from his superiors. The detainees, who included BJP women’s wing president Pooja Pai, were being held at Gorakshanath Mandir (Jogi Math) premises at Kadri, it is said. 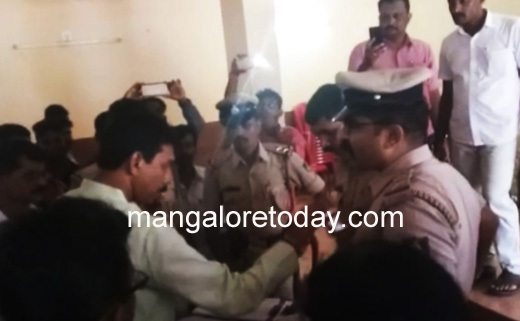 Nalin Kumar was annoyed that the police were preparing to file cases against the detainees and had hence arrived at the venue in a huff, which led to the unpleasant confrontation with the inspector. It is tragic that the city M. P. has chosen to behave like a street goon, when he should be setting an example in civil behavior for the common man.